"Imagawayaki" is a very Japanese-sounding name for a food that is often sold in a manner which is very accessible to Western palates. It's a sort of cake which is very, very similar to a pancake or waffle on the outside and has various fillings on the inside. The most common presentation is one which is filled with red bean paste, and the second most frequently seen is vanilla custard. I walk by a place that sells freshly made taiyaki and imagawayaki in addition to "soft cream" (soft-serve ice cream) several times a week so I have seen how these are made literally hundreds of times. There is a special metal pan with which is well-oiled and has large circular holes. 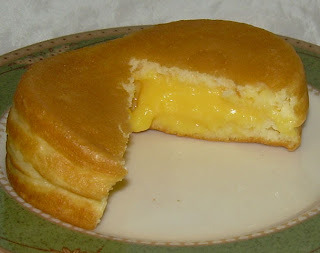 Batter is poured into two sides and a dollop of red bean paste or custard is plopped into the center of one half. After the outside is set and the inside is not yet fully cooked, the two halves are combined and the filling is sealed in the center. Depending on the maker, the amount of pancake to filling ratios can dramatically differ. Though I've never had them, I think this sort of thing is roughly similar to ebelskiver and likely the Japanese treat is derived from some European culinary influence. Though I've walking by this shop hundreds of times, I've never bought one. I was once given a bag of them by a visiting student (well over a decade ago), and thought that the outside had a bit of a funky taste to it and that the pancake part had a weird, chewy, almost tough texture. I figured it was from the oil in the pans which is likely not really cleaned out all day between cakes, but just given a once over with a paper towel before fresh oil is applied. That didn't really turn me off per se, but I just never got around to stopping and buying one. Frozen and ready to face the microwave. I came across this frozen version by huge food conglomerate Nichirei at a local supermarket. I thought that this would be a chance to try a version which readers could find (at least those living in Japan or with access to a Japanese market) as well as reacquaint myself with what they're like. A bag of five cakes cost 398 yen ($4.79). Each is 65 grams/2.3 oz. and has 143 calories and is about roughly 6 cm. or so (roughly 2.5".) in diameter. While hardly a "generous" portion, it makes for a substantial snack. Nichirei makes a point of mentioning that the custard used in these cakes is made with eggs and cream. There are multiple types of instructions depending on how many you are heating and how, but I opted to just have one which you are instructed to heat for 50 seconds at 500W or 600W. My microwave is very uneven in its heating of foods, so I paused at the 25 second mark and turned it over. The result was perfectly warmed without being too hot. Good job on the instructions, Nichirei! It was a little difficult cutting the warmed cake in half for a picture of the interior because it was soft and a little squishy, but not so airy as to collapse under pressure. It smells pretty much like a freshly cooked pancake. The interior texture is really quite good. It's fluffy on the inside and the custard has just enough softness without being too gooey. The custard if very sweet and has a strong but not overbearing vanilla flavor. 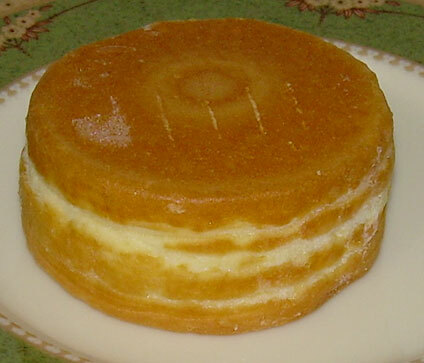 The cake itself pretty much tastes as you'd expect, like a plain pancake. This was really good and I was pleasantly surprised at how well it came out for a frozen food. I've actually done business in my work with frozen food companies in Japan before and I know that they go to great lengths to ensure that the quality of the food is not impaired by the freezing process and it shows in this item. I can't imagine that a fresh cake would be superior to this in any way. Even with the microwaving, the exterior did not come out soggy or have an odd texture as is so often the case with bread products when subjected to microwave heating. I will definitely buy these again and think that they are especially attractive as a quick and sweet breakfast. If you're a pancake fan and don't want to make them yourself or buy some pre-made versions which are often gross or strange, this makes an excellent substitute and you don't need any syrup. Note that my packaging for this is a special release and the usual look can be seen on Nichirei's web page for this product. If you're interested in downloading some quaint seasonally themed wallpapers, Nichirei has some on offer here. i ask my sensei about this food. and she said that this food is good. I have found packages of imagawayaki at the Asian grocery stores here in Canada and I've really enjoyed most of the types I have tried.